If you are a regular user of home hire sunbeds you have probably come across literature or perhaps even used a new 0.3 safe tanning sunbed without knowing it. But what does 0.3 actually mean, and how does it work and more importantly what are the benefits to you with regards to 0.3 home tanning. Well here are the facts and figures and why 0.3 tanning is the healthier new way to get your pre holiday tan. The tanning process occurs when UVA and UVB rays from the sun hit a person’s skin. The UVA rays penetrate the deepest and cause cells called melanocytes to produce melanin. Melanin is an important part of the tanning process as it is the brown pigment in the skin that makes the skin turn darker. 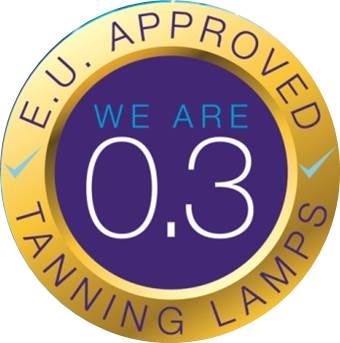 New 0.3 safe tanning machines have basically decreased the amount of UVB rays and increased the amount of UVA rays resulting in a safer tanning experience for sunbed users. In fact if used correctly it is very difficult to burn and because the tan is deeper you actually achieve a more natural looking tan rather than a “Towie orange glow”. The downside of removing UVB rays is achieving a tan on a 0.3 compliant sunbed does actually take slightly longer but the upside is certainly worth it. 0.3W/m2 is the amount of UV exposure that the EU’s Scientific Committee on Consumer Products set as the limit for effective irradiance. A 0.3 sunbed session produces the same tanning experience as the mid-day Mediterranean sun but without exposing the skin to burning. Sunbeds how do they actually work?